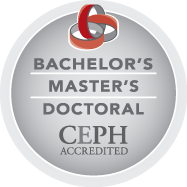 We're CEPH accredited. Here's why it matters. Accreditation literally puts us on the map and in good company with the nation's 50-plus accredited schools of public health. That raises our visibility and reputation, ensures the quality and value of our students' education and degrees, increases our ability to attract committed students and world-class faculty, and helps us secure the resources to support the things we do that are most important. This includes educating the next generation of globally minded public health and human sciences professionals, researching and learning new ways to promote health across the lifespan, and finally bringing that knowledge to our partnership with the public to improve their lifelong health and well-being. The self-study reflects a thorough review of the entire College of Public Health and Human Sciences.